Most of my work is influenced by personal experiences or interests, and usually has a visual impact through the use of colour, pattern or optical illusion. 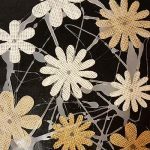 My textile work represents an abiding fascination with stress, as both an element of the artistic process, and as an intrinsic part of our lives. 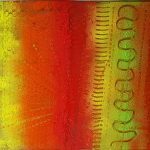 The tensions in my work are established by the use of colour, pattern and optical illusion, to create a compelling sense of force and movement. Photography inspired by the botanical world. By using macro photography and computer generated magnification, and in some cases using a flatbed scanner as a camera, it is possible to bring into view amazing structures and characteristics well beyond that of the human eye. My paintings vary in both style and technique. Many of my paintings are inspired by flowers and natural structures, while others are based on my fascination for pattern, created by tensions and stress. I use various methods to express this: from colour, texture, pattern and contrast; to effects created by the reactions and conflicts of the materials. A variety of work, both abstract and representational - born from new ideas, changes and experiments. 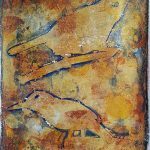 The techniques and materials range from printmaking, mixed media, collage, charcoal, pastel, inks and paint. Please contact me If you wish to purchase or commission a piece of work or need any information. I will get back to you as soon as possible.